From left, Mike Penny, Yukiko Matsuyama, and Rev. Tom Kurai. A night of traditional Japanese folk music featuring the taiko (drum), koto (zither), shamisen (lute) and bamboo flute (shakuhachi) will be presented at the Grand Annex in Downtown San Pedro on Friday, March 7 at 8:00 pm. The Taiko Center of Los Angeles founded by director, Rev. Tom Kurai will lead his ensemble in performing traditional and contemporary taiko music using a variety of different taiko drums and percussion. The Taiko Center has recorded and appeared on film soundtracks, television shows, music videos, recordings, video games as well as live theater and dance productions. The Taiko Center has performed at the Hollywood Bowl, the Academy Awards and on the “Princess of China” music video featuring Coldplay and Rihanna. Recently the group has worked on the American Music Awards with pop diva Katy Perry and Grammy Awards with rock sensation, Imagine Dragons. Featured guests will be the Kyokusen Ensemble made up of Kurai on taiko, Yukiko Matsuyama on koto and Mike Penny on Tsugaru shamisen. The Ensemble will be performing collaborations with the Taiko Center of LA. Yukiko Matsuyama performs on the ancient 7th century koto with authority and grace while infusing elements of jazz, pop, new age and world music. Matsuyama performed on a Grammy-winning recording with Paul Winter and also performed at the Latin Grammy show with international star, Shakira in 2011. 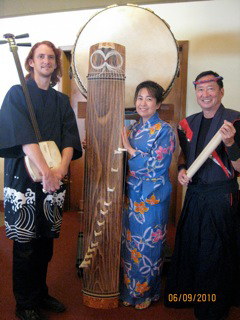 Mike Penny is an award-winning Tsugaru shamisen artist. The Tsugaru shamisen is a 3-string percussive lute which comes from the northern regions of Japan. Penny is one of the leading performers of this instrument in the United States and has produced several highly acclaimed videos with his Mike Penny Orchestra. The opening act for the program will be Team Taiko of the Wilmington Skills Center. Team Taiko is made up of students learning ESL and career skills at the LA Unified School District Harbor Services Adult Education Division. This unique program offers taiko classes taught by Rev. Tom Kurai at the Skills Center. This program is managed by the Grand Vision Foundation of San Pedro. The sponsor of the program and the evening concert is The James Irvine Foundation.